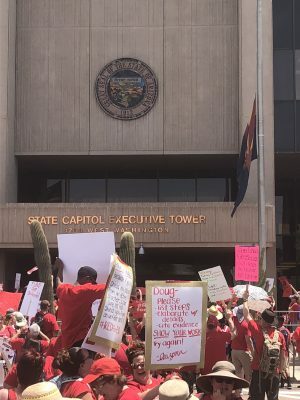 PHOENIX – After three days of walkouts by Arizona educators and supporters at the state Capitol, leaders of Arizona Educators United announced they would continue Tuesday and Wednesday. The walkouts started last Thursday, with more than 50,000 educators and supporters marching from Chase Field in downtown Phoenix to the state Capitol in a demonstration for better pay and more school funding. The walkouts caused numerous school districts around the state to close their doors last week, with many announcing they would remain closed through Tuesday with the fear of not having an adequate amount of staff to provide a safe learning environment for students. Arizona Gov. Doug Ducey announced Friday that he, Rep. J.D. Mesnard and the Senate President Steve Yarbrough had reached a deal that would raise teacher pay by 20 percent in the next two years, an additional $100,000,000 for support staff over a five-year period and no tax increase. But Joe Thomas, the president of the Arizona Education Association, and Noah Karvelis, an organizer of Arizona Educators United, rejected the so-called deal in a press release. Legislative leaders previously vowed to work through the weekend to finalize the details of the budget so it could be introduced this week. Educators and supporters fled to the Capitol Monday, determined to speak with lawmakers about the proposed budget deal. 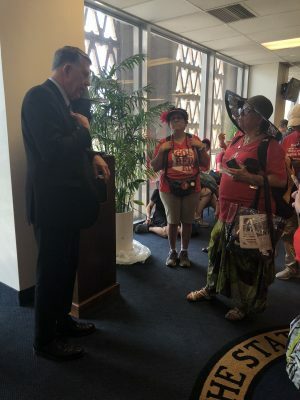 A group of educators even made their way up to the third floor of the Senate building, where lawmakers gathered in the gallery to hold a rules committee hearing. There they spoke with state Sen. David Farnworth, who said he predicted that lawmakers would push through a budget bill on Thursday, also suggesting that he would vote in favor of the bill. Posted in Advocacy, Educators Protest, Funding For Education, Pension & Salary, Students and Parents Protest and tagged #iBelieve, Accountability, Accountability System, Advocacy, Department of Education, Diversity, English Language Learners, Equity, Every Student Succeeds Act (ESSA), Failing Schools, Federal Education Policy, High-Needs Students, Pensions, Public Education, School Choice, State Budget, Students, Testing and Accountability. Bookmark the permalink. Schools need more funds. What are we willing to sacrifice?